Merle Wood & Associates is pleased to offer the EXCELLENCE V yacht for sale. Built for an experienced owner, she is one of the only yachts available on the market today of her size and pedigree. Abeking & Rasmussen constructed the 5-deck superyacht, which accommodates up to 14 guests in 7 exquisite staterooms. Located on the upper deck, the owner’s suite was created with the ultimate privacy in mind. An exclusive terrace with a Jacuzzi, sunpads, and seating is completely out of sight from the above bridge and offers total seclusion. Twin dressing rooms are large, and the en suites are designed with book-matched marble and light maple wood. A well-appointed double stateroom, designed for charterers’ children or other supernumerary guests, sits just aft of the master suite, opposite the study. Located on the main deck, large guest staterooms are comprised of 2 twins and 3 doubles, each with its own en suite and entertainment system. Merle Wood & Associates welcomes the EXCELLENCE V yacht for sale to its fleet of exceptional vessels. EXCELLENCE V represents another top quality, top pedigree mega yacht – this one from Abeking & Rasmussen in Germany – joining our sales fleet. Having been meticulously maintained with consistent upgrades, the immaculate EXCELLENCE V yacht for sale features a glass-enclosed elevator to usher guests to each deck. Other amenities include a large cinema room, waterfront gym, a large beach club, and various outdoor lounges. Her award-winning Reymond Langton interior is clean and modern with contrasting light and dark woods throughout. 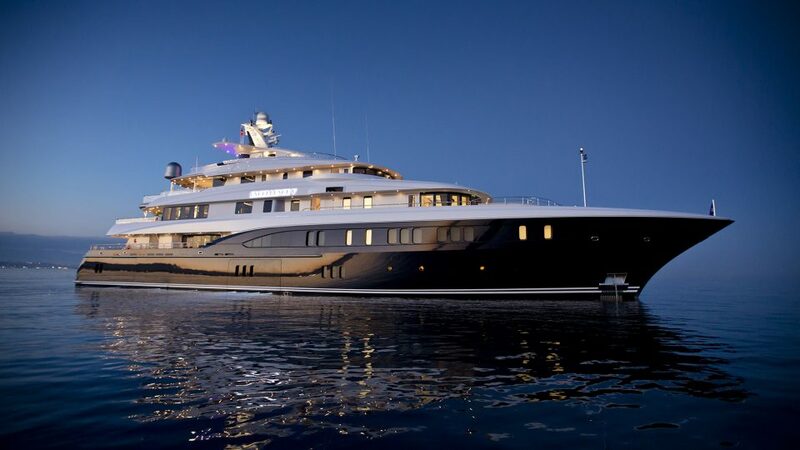 With the interior volume of a much larger, 246’ (75m) yacht, she has a gross tonnage of 1,632, and a wide, 42’ (12.5m) beam. She features oversized windows for maximum natural light and sweeping views of the water. Outdoor dining is located on the shaded bridge deck, which houses a large expanding table and a full bar with a large television. A highly popular charter yacht, EXCELLENCE V’s experienced captain and owner team have successfully built 5 of the world’s most distinguished new construction projects. With wide side decks, and three hull openings for a variety of ocean interaction, everything from stem to stern has been well planned. A spacious beach club is located amidships to starboard, where guests can relax uninterrupted by tenders and water toys. Powered by twin MTU diesel engines, she offers a maximum speed of 14 knots, while cruising speed is at 12 knots, which provides a 4,800nm range. Classed to Lloyd’s and MCA-compliant, she was built with a steel hull, and an aluminum superstructure. For additional information, read the full EXCELLENCE V yacht specs or view the EXCELLENCE V yacht price and details. For information about the EXCELLENCE V yacht for sale, or for expert knowledge from a qualified yacht broker, simply contact the luxury yacht brokerage firm of Merle Wood & Associates for assistance.